An wonderful shot of this Indigo Snake in the field in our herp photo of the day uploaded by kingsnake.com user ACO3124! Be sure to tell them you liked it here! San Francisco is having an invasion of sorts on their public transit. 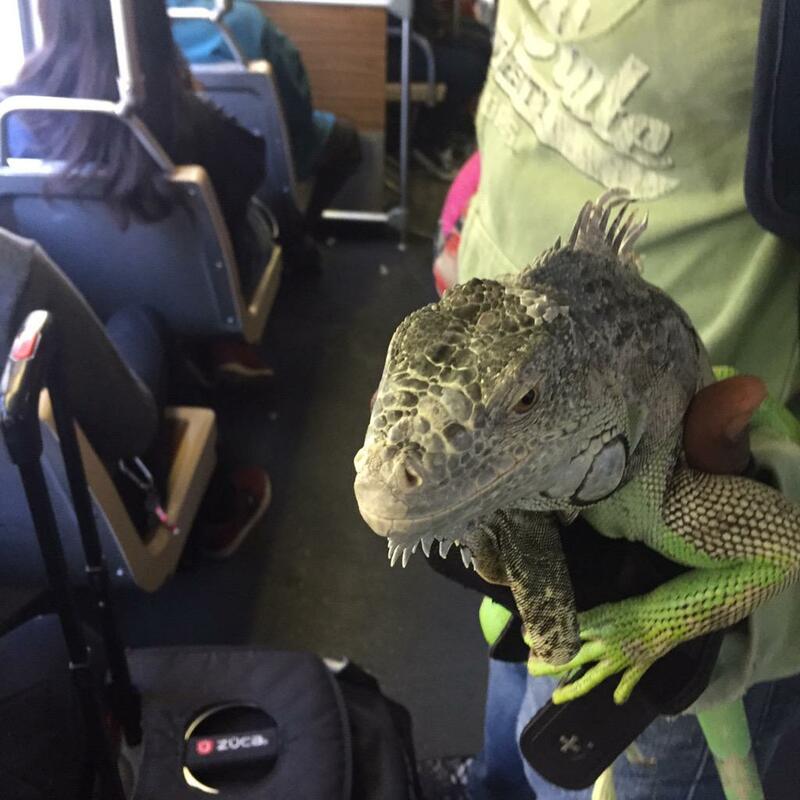 It seems many owners of Green Iguanas are taking over, bringing their pets on the bus. While we wish it weren't causing such a stir, looking at these photos, we can certainly understand why! When transporting your reptiles, be it via train, plane or automobile, it is wise to properly secure that animal. Dogs have leash laws and many places have a law banning releasing cats, it is only wise for us to contain our reptile pets. Looking through these photos, it is clear that if the animal tried hard enough, there is no protection to keep them with their owner. Outreach is great, sharing our pets is wonderful, but pushing limits can bring upon strict rules. Practice safety at all times when transporting your reptile pets, not only for the safety of others but also for the safety of that animal. Read the full article at City Lab. Finding examples of the Scarlet Kingsnake (Lampropeltis triangulum elapsoides) in Kentucky can be quite difficult. On a scale of 1-10 I give them a solid 7.5, perhaps lower if you live in or close to a county where they occur. As for myself, I have to drive over 3 hours each way to be in the game. The easiest way to locate this species in my area is to road cruise for them. I can run that drill, but I prefer to utilize and deploy artificial cover, and by doing so I, along with my colleague Phil Peak, was able to locate a sexed pair under metal this year. A cast shed from the male was under the metal and the female was just preparing to shed as you can see in the photo of both snakes. These snakes were found in mid to late April and we believe that they were preparing to mate or less-likely had already bred. There is always a reason or series of reasons why snakes are found when and in the way in which they are located. Interpreting this information is something I find interesting as it helps to increase the number of snakes I find in the future! I want to welcome everyone to my first kingsnake.com blog and want to thank Jeff B and everyone else here for the opportunity. I plan to have both captive and field-oriented posts that will focus on snakes but will also include lizards, frogs, salamanders, turtles, and crocs! Because this is my first effort here, I wanted to kick things off with a kingsnake! Meet an upset Mohave rattler. Again came the now familiar cry -- "snake!" But this time it was I who noticed the hefty serpent at road edge. Either a western diamondback or a Mohave rattler-- and it proved to be a 3 1/2 foot long example of the latter. Jake had been getting a few minutes of shuteye before we reached our chosen hunting area. We expected it to be a long night as we searched out the anurans. The torrential rains that had fallen for the last 2 hours has stopped but the desert was soaked, dry creeks were raging and playas were filled. My yell jerked Jake instantly awake and by the time I had stopped the car he was piling out. Mohave rattlesnakes (yes, it's now spelled with an "h" and not a "j"), Crotalus s. scutulatus, have reputations for having bad tempers and this one was certainly living up to that reputation. The hefty snake had begun striking the moment Jake had stepped from the car. 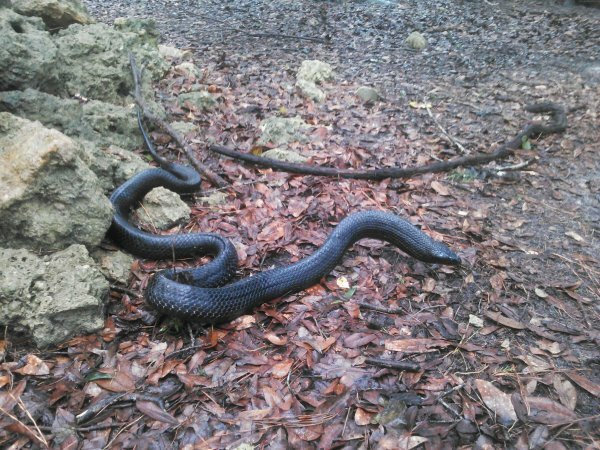 Not only did the snake strike so hard that it slid forward each time on the wet and slippery road, but the striking was incessant, causing Jake to take couple of involuntary steps backward from the pavement. Of course this brought him (equally involuntarily) into an unexpected rear attack by formidably armed "monkey-get-back-bushes" (mesquite, cats claw, and beaver-tail cacti). Then and there Jake performed an impromptu rendition of that horrid old dance the we old timers refer to as the "green-apple-quickstep." Jake proved far more agile than I had credited him to be! But eventually Jake's perseverance prevailed, photos of the Mohave were taken and we were on our way again. 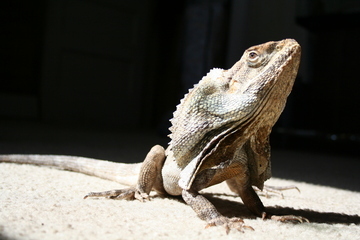 Continue reading "The Mohave Rattler"
Take 5 and turn your face to the sun today, just like the Frilled Dragon in our herp photo of the day uploaded by kingsnake.com user cochran ! Be sure to tell them you liked it here!